Last Thursday Alan MacLeod of Mooney's Wake and North star fame put on a multi-faceted event at Mooney's for John Peel Night, along with dozens of other promoters throughout the country. I was due to spin a few discs as part of the DJ team, but at 5.30 pm Alan called to ask if there was any way I could do a 20 minute live set. As in playing the guitar and singing, something I hadn't done in Lerwick for nigh on a dozen years. Someone had dropped out and he just wondered...it took me all of 15 seconds to say yes. There was a time, of course, there was a time...when I arrived in Shetland in 1986, I was one of the few people with an acoustic guitar you could just plug in to a PA. I had fitted a Di Marzio transducer into my (much missed) Gibson J40, and with a Barcus Berry pre-amp, it sounded fantastic. Fantastically loud, anyway. I remember my first gig in the isles, a benefit for the Campaign Against Dounreay Expansion at the North Star, and people were dancing to just that single guitar. After that came the solo album (on vinyl, of course) The Revenger's Comedy, collaborations with Brian Nicholson (including the tape release Stormbound) and our band The Zetland Beat and Rhythm Kings. We played two, three hour sets, wrote our own songs, had a great time, then stopped. I left the islands in 1990 to work for The Scotsman, and music making/performing gradually dried up, with occasional outbreak of performing, mostly thanks to indefatigable supporter and fan Rob Ellen. Just lately, though, I've been recording some old songs and writing a few new ones too, drawing inspiration from a new guitar (by the great Jimmy Moon), my son James's developing bass-playing skills and the sense that all that effort, all that stuff, shouldn't be allowed to go to waste. Because so much time, money and energy was spent on music: From my first guitar aged 11 (still got it: a Selmer) through all the others - Guilds, Gibsons, Martins, Fenders, Tokais, Simon and Patricks...the hundreds of songs, the demos and albums recorded, bands formed and deformed, gigs played, tours, drinks consumed, relationships formed and sundered. And what joy in it. The notion of communicating with an audience, with other musicians, the sheer beauty of acoustic and electric guitars, the noise, the history. The hewing out of something your own, having listened to and loved so much made by other, better performers and writers. 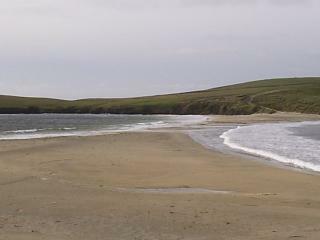 This is the world-famous tombolo, or double-sided beach, between St Ninian's Isle and Bigton in the south mainland of Shetland. 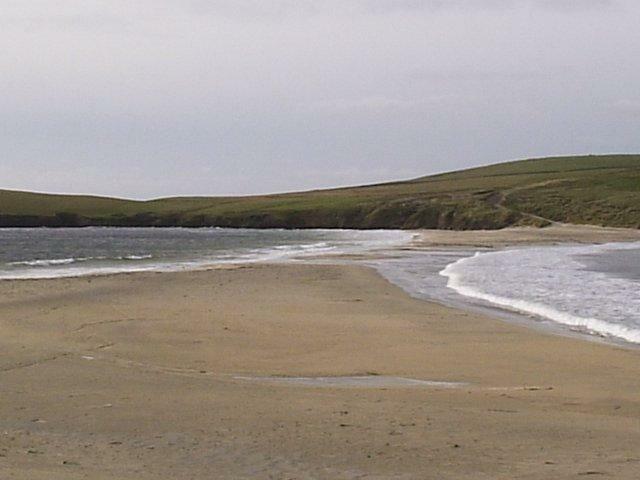 On Sunday, for the first time in my experience, the sea had broken through the spit of sand - combination of high tide and stormy weather - though it was still possible to cross to the island, albeit with wet feet.